Shop local at Austin&apos;s beloved boutiques, such as Parts & Labour for Texan-built T-shirts and baby onesies; Toy Joy for nostalgic playthings; uncommon hip gifts at Wanderland; and A-Town Boutique&apos;s goods by 100+ local creatives (think wood cake toppers, apothecary items and stitched wine totes). Austin&apos;s retail scene is nothing short of brilliant — Clever boutiques alongside cutting-edge housewares alongside "where&apos;d you get that?!" artisan gifts. Styles are born here and there&apos;s an abundance of hot spots for light-years-ahead-of-the-trend frocks and jewelry. Flip through vintage and consignment clothing and try on artisan shoes at Restyle, New Bohemia and Feathers Boutique. Get lost in a word of jewelry - wedding, handcrafted, custom designer collections and more - at Eliza Page and jumpsuits, Austin-made maxi dresses and the latest heels, wedges and shortie boots at Stella Says Go. Guys update their modern to classic styles at Stag Provisions for Men and snag sleek blazers and button-downs at Service Menswear. 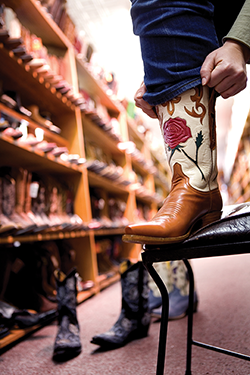 All walks will love the handmade kicks and western wear at Allen&apos;s Boots and coveted international labels at By George, named one of the country&apos;s Top Ten Boutiques byLucky Magazine. Seek out locally produced home goods at SERVE and Breed & Co., where you&apos;ll find kitchenware and garden goodies and wonder how you ever lived without. Relaxed, town-square-strolling unfolds at The Domain with 700,000 square feet of restaurants and haute couture, including Tiffany and Co. and Louis Vuitton. Shop The Arboretum&apos;s Pottery Barn and Z Gallerie, then break for bites at Cheesecake Factory and some rejuve time at AZIZ Salon and Day Spa. Nearby outlet shopping is a terrific way to score up to 65 percent off on designer brands. Stock up on Gap, J. Crew and Kate Spade at San Marcos Premium Outlets and hit Round Rock Premium Outlets for steep discounts at Michael Kors and Burberry. Ultimate pre-holiday buying fests take place at local fairs and markets. Make a weekend of it at the free and super family-friendly Violet Crown Arts Festival Dec. 6-7. Meet area sculptors, potters, fiber artists, painters, jewelers and more as you browse their wisely crafted wares. The Cherrywood Art Fair, Dec. 13-14, pairs shopping with all-day family activities and live music. Who&apos;s who of Austin artists will be there showcasing award-winning funky furniture, shiny accessories, pottery and amazing art you won&apos;t find anywhere else. Celebrate everything Austin with some stylish merch. Our online Austin Gift Shop offers unique local items by Texas and Austin artists, as well as Austin Live Music Capital of the World® branded merchandise.